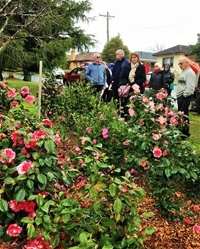 The Webmaster is always on the look out for gardening tips and ideas from members that can assist others to enjoy the great hobby of gardening. Potassium – This is the main nutrient found in banana peels. Potassium helps with root development, encouraging a good flow of nutrients and water in your plants. It is also involved in regulating enzymes within a plant, which helps promote stronger plant stems and thicker cell walls in the fruit. Because of these factors, potassium helps your plants to become more drought-, disease- and pest-resistant. Phosphorus – The second highest mineral in banana peels, phosphorus is important in seed germination and viability. It is a necessary element for the production of blooms, pollen, fruits, and healthy roots. Because it is essential for good root and shoot growth, phosphorus lends to overall plant strength. Magnesium – The nutrient which helps with the production of chlorophyll, magnesium keeps plants green for photosynthesis. It is also used by plants for the metabolism of carbohydrates, meaning it helps to actually feed the plant. How I’m Using Banana Peels In My Garden Compost Tea. Any time you soak a solid in a liquid for a couple of days or more, that liquid leeches some of the nutrients out of the solid. This is called a compost tea. Since we don’t eat enough bananas at one time to warrant running the dehydrator, I put the peels into one of these 2-quart pitchers about 3/4 full of water and let them sit in the fridge. In this case, the water is drawing out some of the potassium, phosphorus and other micronutrients from the peels, making the compost tea rich with nutrients. When we eat a banana, I’ll tear the peeling into narrow strips and chop them up into small chunks. Those chunks go into the water and sit in the fridge until we have eaten enough bananas to fill the pitcher. At that point, I let the pitcher sit for one more day until we eat another banana — at which time, I strain the liquid off the banana peels (using a wire mesh strainer like this) into another pitcher, clean the first pitcher, fill it 3/4 full of water again, and repeat the process. I keep the banana tea in the fridge so that it doesn’t go bad until I’m ready to use it (which is about once a week). One way to use the mixture is as a liquid fertilizer. 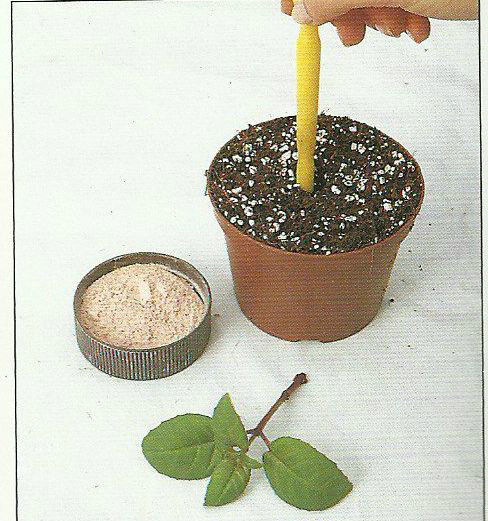 Just mix a cup into a gallon of water, and water the base of your plant. Oh! Don’t let the peels themselves go to waste though! We’re about to put our dehydrator to good use. Dry Fertilizer Another way I intend to use banana peels in my garden is as a dry fertilizer. When the banana tea has steeped long enough, and I have strained the solids off the liquid, I break out our Nesco Snackmaster food dehydrator! (Have I mentioned lately how much I love my dehydrator?!) I cut parchment paper to fit in the trays, spread the chopped up peels on each tray, and dry them at 160ºF. It usually takes about 8-10 hours. If you don’t have a dehydrator, you can spread the peels out on a cookie sheet lined with parchment paper and bake for about 8 hours at the lowest setting on your oven (mine only goes down to 170ºF). Once dry, you can store them as is in an air-tight container, or do what I do and pulverize them with a mini chopper (similar to this one). Really, you would get a finer grind on the peels if you used a coffee grinder (this is the one I want), but since I don’t have one the chopper will have to do for now. Just understand the smaller particles break down faster and becomes more readily available to the plants. When I plant something new, I’ll be adding 2-3 tablespoons of the powdered banana peel in the planting hole with the seeds or seedling. 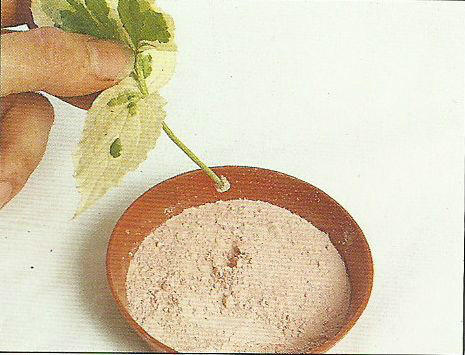 The powdered peels will feed the seedling slowly and not scorch or burn the roots like commercial fertilizers may. 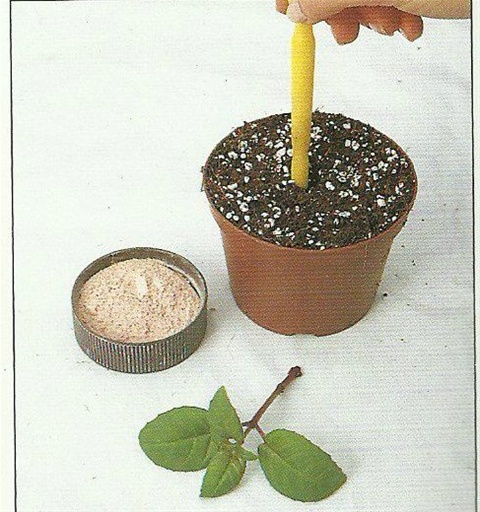 Other Ways to Use Banana Peels In The Garden As a Fertilizer Slurry If you want to do things the super easy way, you could just make a slurry with your banana peels. Save as many as you would like in the freezer until you’ve got enough, then put them into a high speed blender with some water and liquefy the mixture completely. I would recommend using this under the soil so it doesn’t attract harmful insects and other pests looking for a quick snack. As Compost Material Probably the most popular and easiest use for banana peels is to just toss them into the compost pile. They are classified as green materials that add a healthy dose of nitrogen to the compost as well as the other nutrients and micronutrients we’ve already discussed. If you’re into vermicomposting, you can add chopped up peels to your worm farm. The worms will eat the banana peels, break them down, and redeposit them as nutrient-rich worm castings. 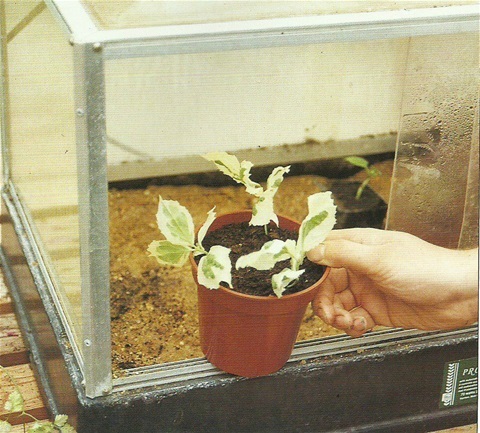 As Mild Plant Food for Seedlings If you’re starting seedlings in a greenhouse, or even indoors in a mini greenhouse like this one, use the diluted banana tea or a pinch of the powdered peels as plant food for your tiny starts. The nutrients will ensure your plant gets a good start with a healthy root system and a strong main stem. As Soil Amendment If you don’t have a compost pile, you can actually use banana peels as a soil amendment. Add them directly to your garden in late fall just before (or after) you have cleaned out the bed for winter. The rich organic matter will add those valuable nutrients directly to the soil, and the decaying material will attract beneficial microbes and worms to help create air pockets in the soil (and leave behind their free fertilizer in the process). Final Notes About Using Banana Peels in the Garden If you don’t eat a lot of bananas, don’t fret. Store peels in a gallon size zip bag in the freezer all season long until you have enough to use. When spring rolls around, you can give your new plants and seedlings a healthy start. Many other plants (like roses and staghorn ferns) also benefit from the minerals found in banana peels. 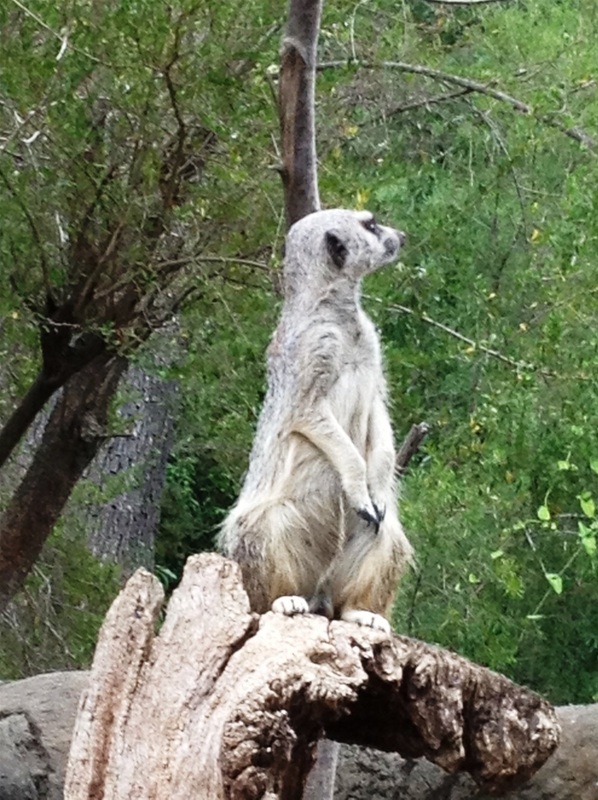 Feed them regularly to give them a boost of healthy nutrients! Use dried banana peels with other homemade fertilizers (like crushed eggshells, Epsom salt, and used coffee grounds) for a super nutrient dense, DIY plant food. 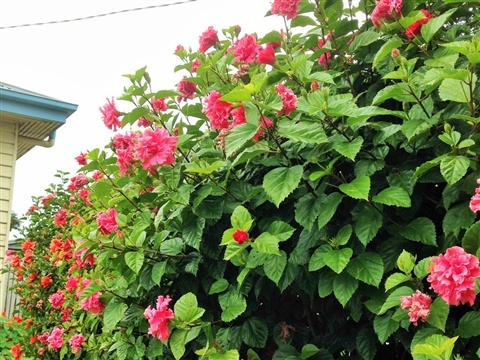 Hibiscus are mostly frost tender so it is often considered that they will not grow in this area. 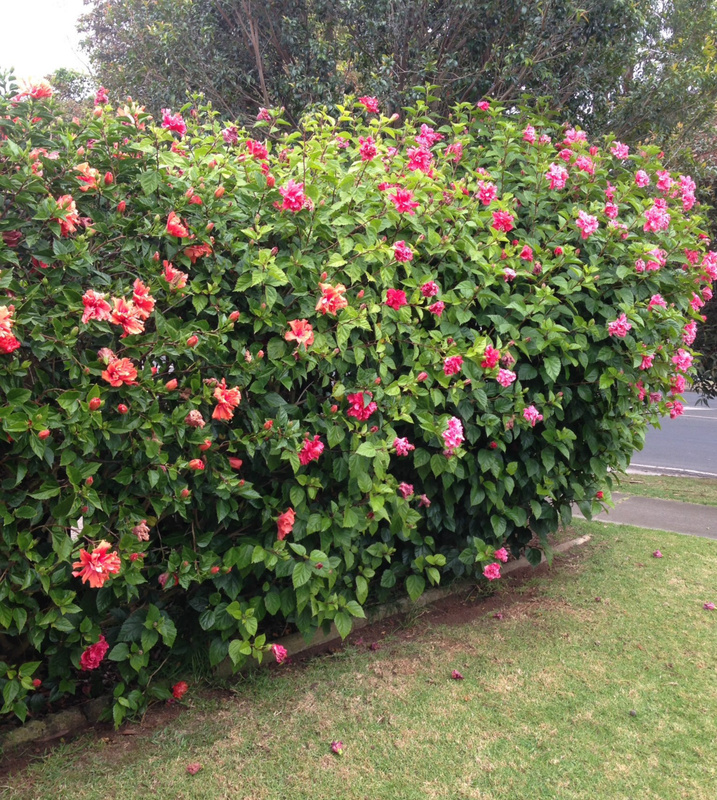 The 3 photos below of a 30 year old Hibiscus hedge in Drouin demonstrates just what can be achieved. The trick is protecting young plants against frost by planting close to the house or throwing an old sheet over them on nights when frost is forecast (the same applies to newly planted Jacarandas). 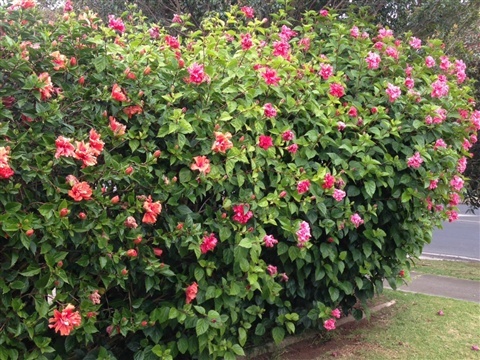 Hibiscus require regular fertiliser as they are heavy feeders. 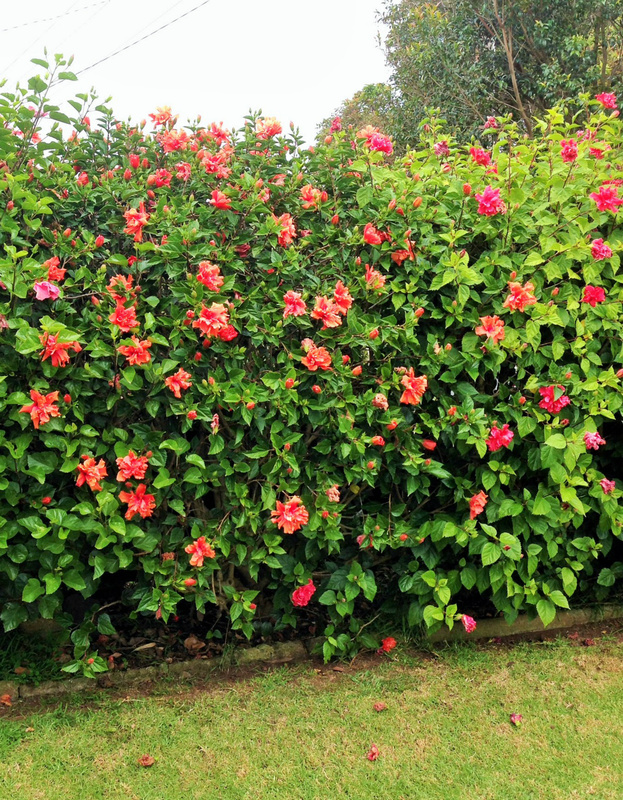 The hedge seen below is trimmed in early September after frost damage is unlikely. Frost usually damages the ends of branches and these should not be trimmed off too early, otherwise another frost will cause further damage. Fertiliser (Neutrog Sudden Impact for Roses) is applied at that time and after new foliage appears a spray with pyrethrin or Mavrik will kill aphids. If die back occurs after winter the hedge quickly responds to pruning and a spray with Copper oxychloride (Leaf Curl Copper). Early Spring is a good time to consider propagation of new plants.The most common thing to do is to buy seed or seedlings. 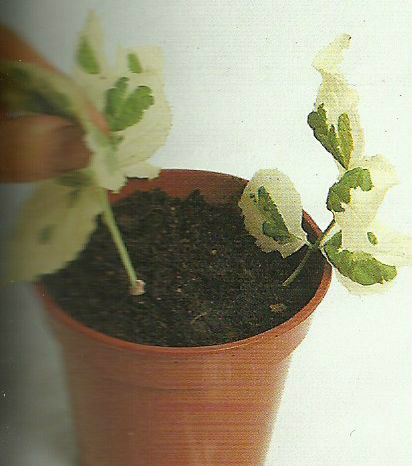 The more fun thing to do is to propagate by taking and growing your own cuttings. 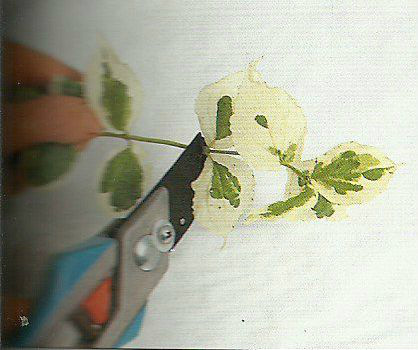 We would like to give you a few tips on taking cuttings from your own garden or from the garden of another enthusiast. We will give you a series of tips under various headings. 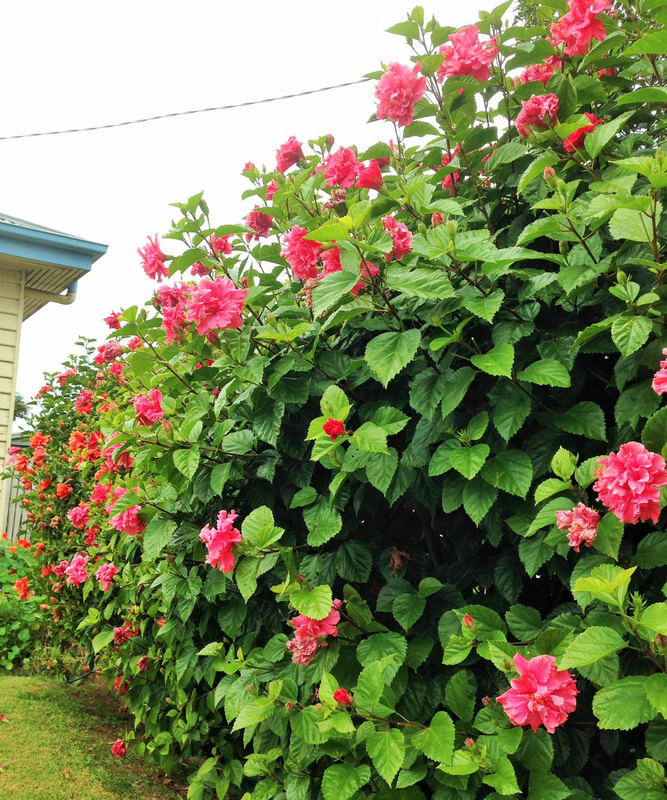 1.Many Shrubs such as pelargoniums(geraniums) can be produced during the early flush of growth. 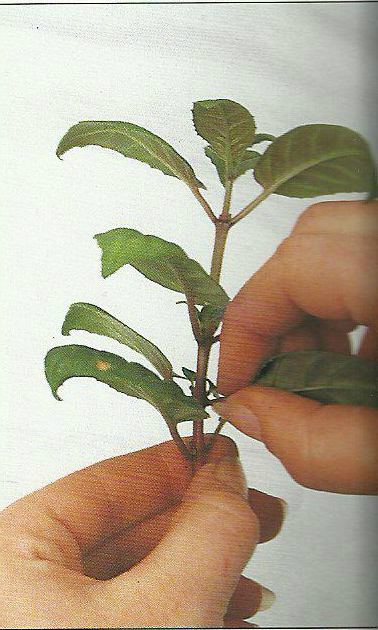 The length of the cutting is not critical but do cut below the third leaf or pair of leaves from the tip. 2. 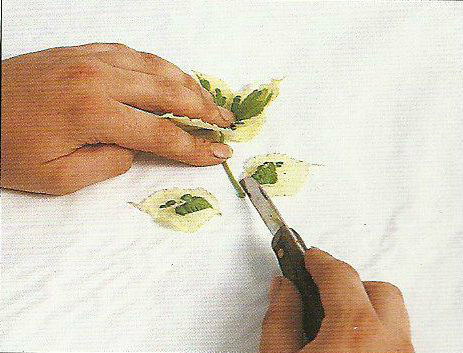 Trim off the lowest pair of leaves. If the plant has stipules(small scale like growths at the base of the leaf stalk)pull these off too. 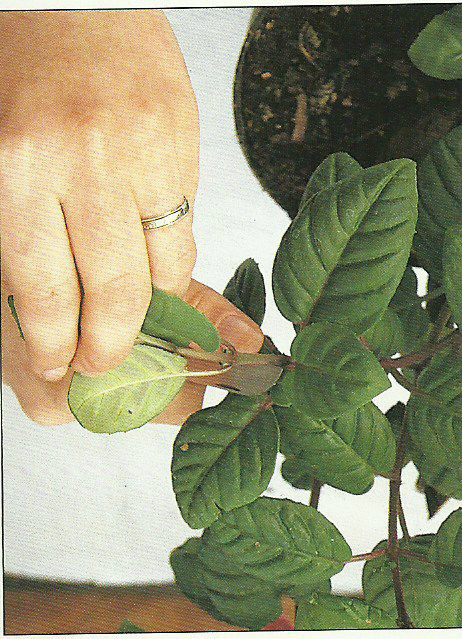 Trim the base of the stem with a sharp knife or blade, cutting straight accross the stem just below tthe leaf joint. 4. Use a dibber to make a suitable whole in the pot of cutting compost for the prepared cutting. 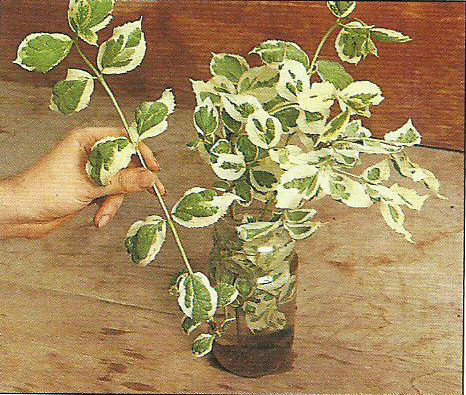 Take the cuttings once the new growth has begun to slow down, usually early summer. 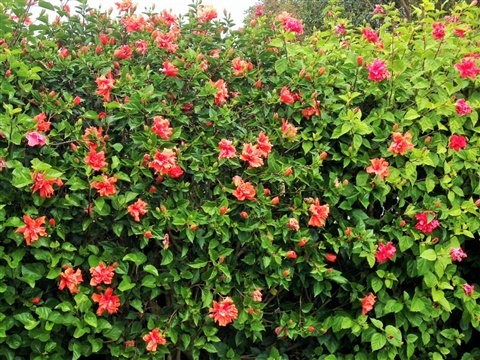 The length will depend on the plant, but for most shrubs remove the top 10 cm (4 inches) of the shoot. 2. Put the cuttings into a polythene bag or a bowl of water until you are ready tp prepare them, otherwise they will wilt rapidly. 3. 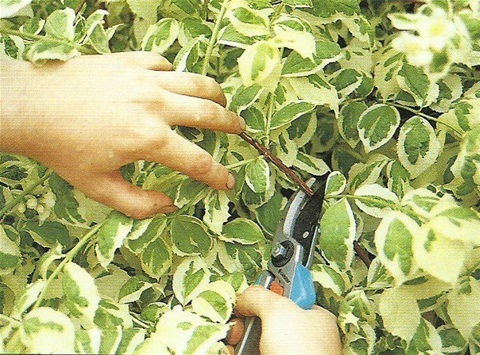 Shorten the length of each cutting to about 8cm (3 inches) , though you must adjust this to suit the plant. Cut straight across the stem just below the leaf joint. 5. Dip the cut ends in a rooting hormone, to ensure speedy rooting. 6. 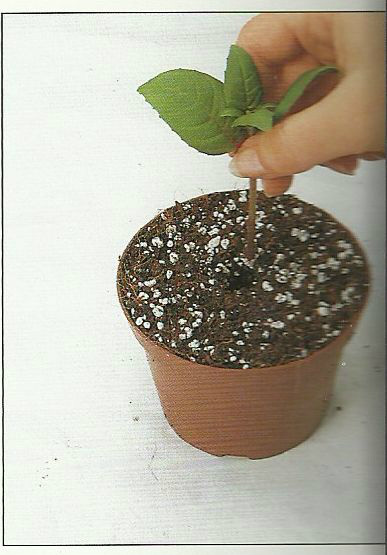 Insert the cuttings around the edge of a pot, then water with a fungicide and leave to drain. 7. 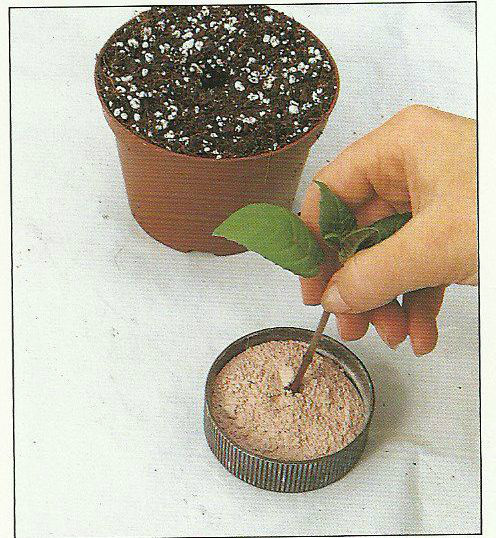 Place the pot in a warm and humid propagator in a light place out of direct sunlight. If you don’t have a propagator, cover the pot with a polythene bag instead.